Skate, travel, repeat. Get some insight into Barney Page today via Etnies during the filming of his etnies’ Album video part. David Reyes, Silvester Eduardo, Albert Nyberg and Barney Page visited South Africa for an etnies tour and came back with some sweet footage. The good folk at SoleTechnology, the company behind the Etnies brand, have spent the last 29 years researching and developing skateboard shoes. This maybe longer than your entire existence, but they have never seemed to tire in their quest to lead the way in skate shoe technology. If you look back to the beginning of this impressive reign it’s easy to remember that they pretty much invented the traditional skate shoe look, that has evolved over the years. Now in 2015, the scene has changed tenfold, with the intrusion of transnational sports brands dominating technological developments in skateboarding. Independent skate shoe companies have had to dig even deeper to provide not only ground breaking, unique designs, but to also produce high quality products on a par with these sports giants who have pioneered the lightest and toughest materials for those who want to break records. Knowing that SoleTech have spent more hours since 1986 prepping these materials than you’ve probably spent skating streets, the flame could not have been passed to a better team to give the ‘athletes’ a run for their money In the Jameson SC, that flame should hopefully torch some sense into those who think that funding sports brands and allowing money to leave the skate scene is acceptable. 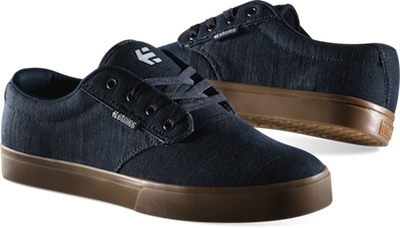 I must be honest here and admit that when Etnies started bringing out The Scout and similar sports-looking skate shoes, my heart sank somewhat. They looked from here like they were designed for non-skaters. I personally chose skateboarding to avoid mainstream sports and the tracksuit-clad knobheads who liked beating up skaters for fun in my local area. I certainly had no desire to dress like them. Skateboarding was, and still is unique; or is it anymore? Sports brand culture has infected the scene so badly that even skate shoe companies have had to re-address the balance of their designs to compete with the onslaught, but Etnies have brought their usual class to the table, spun my head with their use of man made materials and delivered Supreme Comfort to my feet like I’ve never felt before. Yeah, it sounds crazy but these shoes are like walking in space. So the question is, can you skate in them? These arrived in the post for review the day before a weekend camping and skating trip. I took one look at the sole and immediately packed a pair of vulcs to skate in, as the foam-like undercarriage didn’t look they would cope with griptape whatsoever, but I was so wrong. They stuck perfectly allowing me to move freely on a cruise and suddenly skateboarding felt totally different for the first time ever. Another first was feeling a breeze in 28′ heat through the breathable mesh. These were the happiest feet I’ve had skating in years. I’m not sure if they would last forever if you skate daily and love your flip variations, but to cruise around in, they were perfect. Like any other skate shoe, the mesh is durable, but no shoe lasts forever if you are out there pounding it. Saying that, your heels feel well protected in the Jameson SC as there’s an inch of STI foam built in to assist the impact; technology that SoleTech are very well known for. The Jameson has always been my favourite Etnies shoe as it’s a proper chiller, being simple in its design and one of their best sellers. It was never a ‘sports shoe’, but this version that mixes parts of The Scout, feels like what I’d imagine a sports shoe to feel like. That’s if you can remember they are actually on your feet, as they are seriously lightweight. Perfect to chuck in your bag for a trip and ideal for wearing after a session to give your feet some much needed loving. There are no rules to say you even need laces in them thanks to lycra spandex tongue straps inside the shoe. It holds together well and allows great movement too. The greatest part of skateboarding is that us skateboarders don’t have or need rules as such, we all set foot on a deck for the first time with only one simple code of honour: that we support skater owned. One day, when skateboarders wake up and remember that worldwide, they will hopefully thank Etnies for being there; for caring about skateboarding and spending every minute of their day thinking about your feet. This pair have grown with etnies over the years and put their work down in Croatian spots in this new edit. In an age where mainstream brands outside of skateboarding have come in and flexed muscles with large wads of cash with no scene history whatsoever, you have to admire the loyalty that Ryan Sheckler has shown to etnies. Fifteen years has gone by since he joined the brand and he is still one of the most consistent performers on a skateboard out there. That loyalty is a rare sight in this corporately challenged landscape, especially in a recession, but I guess when you are dealing with a company that is 25 years young, and run by skaters who get out of bed for the right reasons everyday, it’s worth pledging your allegiance for. Take note. So here it is, UK skate videographer Mike Manzoori and etnies have rolled out a tribute video looking back at those 15 years of service with Oliver Barton, Ricki Bedenbaugh, Atiba Jefferson, Manzoori himself and Arto Saari. Enjoy. 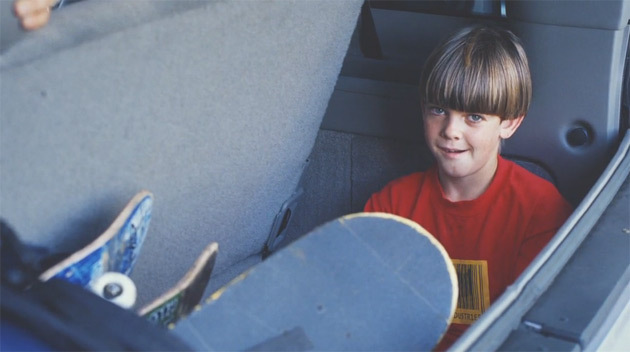 etnies Presents: Ryan Sheckler’s Fifteen Years Strong from etnies on Vimeo. A pair of these Etnies Marana’s were sent to our office in January. No note, no info, not even a follow up to this very day, they just arrived awaiting to be skated, sat in a box on their own, looking shiny, Black and brand new. I’ll get straight to the point with these. As soon as they are on your feet they feel strong all round. You feel protected. It’s definitely due to the combination of various materials used to build this shoe and put to the test, the Marana stands up and delivers a multitude of positivity. The protection simply brings confidence which is not a feeling derived from the many skate shoes made today that are actually designed for the mainstream. These are built for skateboarding and come with a tough shell to cope with that in mind. The padded tongue stays straight and doesn’t droop to the sides and overall the shoe doesn’t seem to wilt like some others after a few skates. It helps also that these are made by one of the only remaining skater owned shoe companies left. The Marana’s are worth your investment and retail at about £60. Out now. The ever impressive Sole Technology group behind the Etnies, Emerica and Altamont skateboard shoe and clothing brands have announced this week that they have opened a new ecological European office. The environmentally friendly building based in the Houthavens district of Amsterdam, Holland is said to host 60 solar panels that once hit full capacity, share excess energy to households in Amsterdam and a state-of-the-art geothermal heating and cooling system that accounts for a 40% reduction in energy consumption compared to a conventional system. 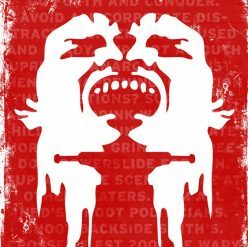 Long may it continue and long may skater-owned brands challenge the unethical ways of the corperations that are pushing their way into skateboarding. Read more about Pierre and his hard work for skateboarding from our interview back in 2006. New Almost pro, Willow has an amazing new section here. Support him, as he rocks and Almost rules the roost. That feeling of a new, fitted shirt cannot be beaten, especially when found in a sale coming in at only £25 this month. Etnies have a sale on right now on their website as the seasons change and one of the bargains we have picked out for you as a reccomendation this week is the Chillaxin shirt. 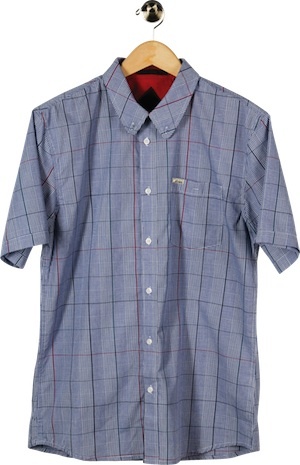 It’s soft 100% cotton comes in a plaid design with short sleeves, front chest pocket and is well worth the dough. Grab one today as we bound to have a late summer and when it kicks in at the end of August you will be ahead of the game this year. Click here to have one sent to your doorstep. Also comes in grey/black. Remember when Etnies launched their ‘Buy a shoe, plant a tree’ initiative to restore the Costa Rican forests last year? At the time, we were sent over a pair of these to check out and they were a serious winner. This year, the quest still goes on. Etnies’ drive to make shoes made from recycled tyre parts, bottles and cork are still going strong and are still as comfortable twelve months later. Fake vulc and a canvas upper comes stylishly packed into the most basic and lightest shoe out there right now primed to be your best mate over the summer months. The best news of all is that you can grab these in the Etnies sale that is going on right now at £44.99. They come in 13 different colours this year so treat your feet to a pair of fresh pumps that will make you feel good about giving back to world that we shred on a daily basis.